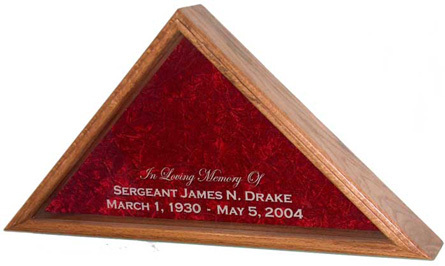 Flag Case designed specifically for the Burial, or Casket Flag which, when unfolded measures 5 ft. x 9-1/2 ft. These Large Flag Cases will also beautifully display your 5 ft. x 8 ft. and 4 ft. x 6 ft. flags. Accepts folded flags up to the 5ft x 9.5ft coffin/burial flag.